Feeling recent minor tremors close to home and watching all the earthquake devastation in and near Mexico City is causing Bay Area residents to think about their own safety. Are we prepared for a huge disaster? 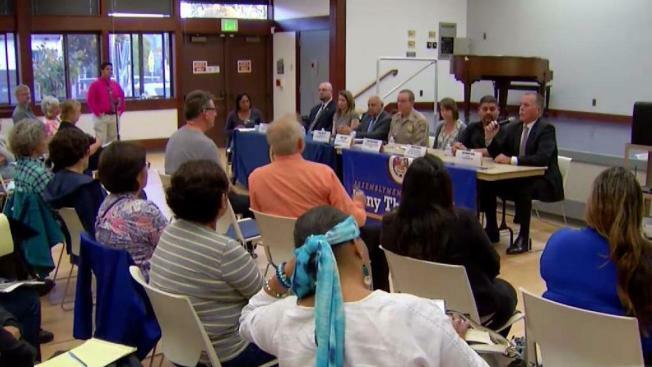 Dozens of people are so concerned about disaster preparedness that they packed a senior center in Berkeley on Thursday night. Many people learned that any type of plan for earthquakes has to be fluid. But a plan definitely is needed because, like it or not, we live in a seismically active zone. "It’s not a question of if, it’s a question of when," said Bijan Sartipi, District 4 director for Caltrans. Ever since the since the 6.9 magnitude Loma Prieta earthquake in 1989, Caltrans officials say they have been working very hard to get ready for the next disaster. "We have retrofitted over 2,200 bridges across the state and a lot of them in the Bay Area," Sartipi said. More work needs to be done, and a panel of experts stressed the basics Thursday night, such as having a family plan and an emergency kit. It also became apparent that getting ready for a natural disaster is an ongoing process, and no one is ever 100 percent ready. "So, Mexico has an earthquake early warning system already in place," said Jennifer Strauss, an expert from UC Berkeley. "The alarms went off before their earthquake. We’re working on one here." The Bay Area's earthquake warning system will be tested in phases starting next year, officials said.